Farmhouse Villa Coluccia's Manor House of 1940. Recently renovated retains the old world charm and the authentic taste in a Organic Farm amidst olive trees and citrus fruits of Salento. Natural light and colors make the rural Villa comfortable refuge for artists, families, groups of friends and solo travelers for a lovely stay in the countryside but close to the sea in the largest country of Greece Salentina. Enjoy the holidays in a private villa and a few places. Professionalism and give you a real family welcome vacation away from home as if you were at home! Villa Coluccia accept bookings for a minimum of one night in double rooms and one Family Suite or in a charming independent studio, with the possibility of renting the whole property or any independent rooms with private bathroom. The outdoor area is rich in places with barbecue and pergola, where every day begins with a sweet breakfast of pastries prepared on the farm with genuine ingredients. We transform our oranges in a delicious jam and at breakfast we serve many other specialties prepared with simple passion by the owner. Coluccia Farm Holiday Villa is a 1940s country house Which has Been recently refurbished. It keeps the charm and the original taste of a biological farm holiday surrounded by the olives and citrus. The natural light and the colors turn rural Villa Coluccia into a confortable shelter for artists, families, friends and solitary visitors who can enjoy a peaceful stay in the countryside close to the seaside and to largest town of the Salento Greece. Enjoy your Holiday in a peaceful place Which can host only few people our welcom and professionalism will offer you a really relaxing holiday. Villa Coluccia accepts two night minimum reservation in double rooms, studio flat or family suit. It also offers to its guests the Possibility to book the entire Villa or its indipendent rooms all provided whit a private bathroom. The outside is provided with barbecues and arbours where every morning our sweet breakfast with delicious cakes is genuine waited on. We turn our oranges in a delicious marmalade and we need other specialties prepared by Villa Coluccia mistress. Villa Coluccia Farm Holiday is a 1940s country house which has been recently converted into organic farm holiday. Its dirt paths go throuh the ancient citrus grove linking the house,the farmstead,the wells and the votive niche in honour of San Francesco. Surrounded by 7 hectars of olive groves, Villa Coluccia is only 10 kms from the adriatic Sea. Its white rooms are characterized by wide views over the greenery, the characteristic venetian paving and typical vault ceiling. Each room is comfortably furnished and has private shower and toilet. 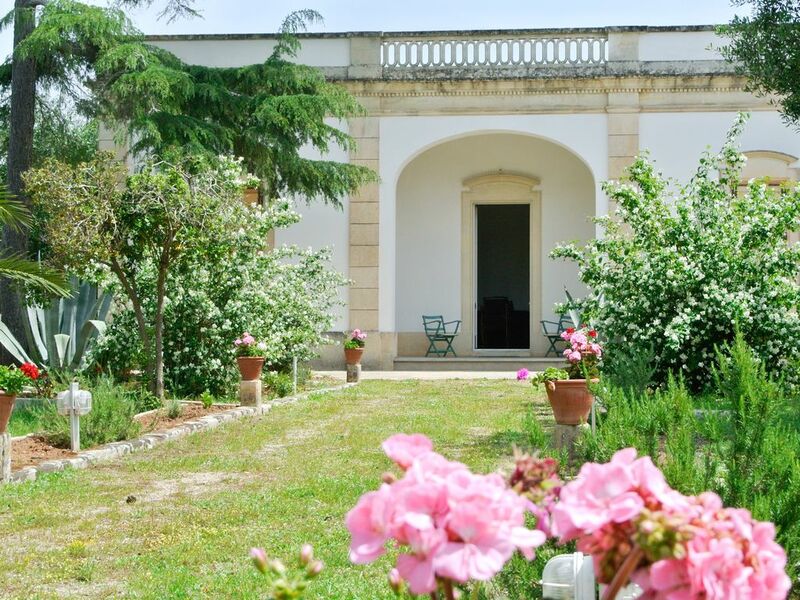 Agritueismo Villa in Martano Coluccia is close to all the most characteristic villages of the Salento and is just minutes from the beaches of Torre dell'Orso, Alimini, Otranto. Stunning cliffs with rocks and cliffs, do not count on the coastline road from Roca leads to Santa Maria di Leuca. The Ionian Sea, more distant, can be reached in just 25 minutes by car.